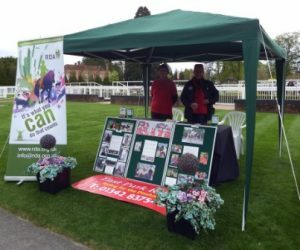 Our bucket collection at Lingfield Park on Good Friday, 14th April, was a great success as the kind racegoers emptied their pockets of £1335! Dame Judi came along with her family, and was interviewed with Sally O’Neill, for both ITV television and the Racecourse PA system. Sally presented a prize to a winning trainer, and our volunteers paraded in the ring with the silks placards for several races. So not only a financial success but great publicity for us as well. We are very grateful to Lingfield Park Racecourse for giving us this opportunity to fund raise, and also to all the volunteers who turned up on the day to help.